July came and went with little baking (or anything else) accomplished as I sported my bright blue cast. In the last few weeks, my walking boot has made me mobile again, though a bit slow and wobbly. I have to prioritize. My broken ankle got in the way of my baking plans for a July military care package, but this August package was important. Paratrooper Derik turned 23 this month and a Monday Box birthday care package filled with Funfetti Birthday Sugar Cookies was imperative. Part 1 Care Package Contents: This birthday celebration box has a balloon theme. The napkins, horns, and decorations have a balloon print. The battery powered birthday candle (a fabulous dollar store find), not only twinkles and changes color, but is also decorated with balloons. Birthdays call for candy but desert safe candy is probably non-existent. I have been told that even Jolly Ranchers (hard fruit flavored candies) can melt. I thought I would give it a shot anyway, trying for some candy that was at least less likely to melt. I included boxes of Sweet Tarts and Spree, gum, and a bouquet of balloon lollipops. A few puzzle books completed the party loot. In keeping with the balloon theme, Vanilla Bean Balloon Cookies were perfect. 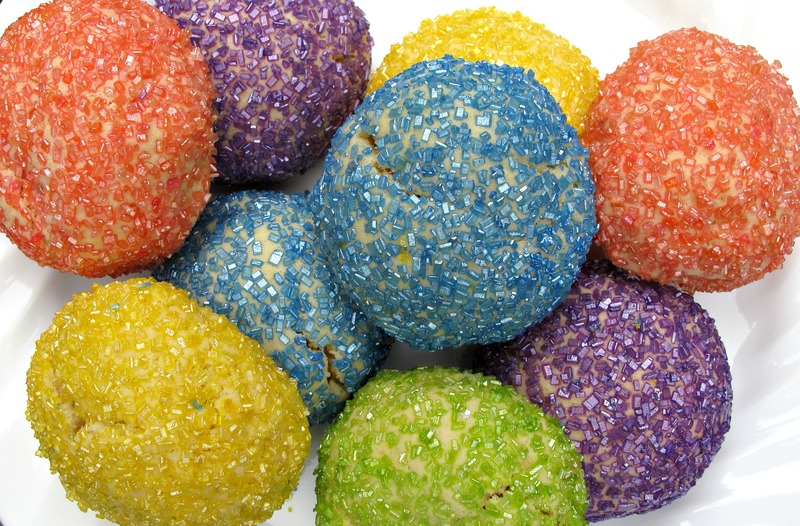 The round cookies coated in colorful decorating sugar ended up being balloons without strings because the sticks were taking up too much room in the box. 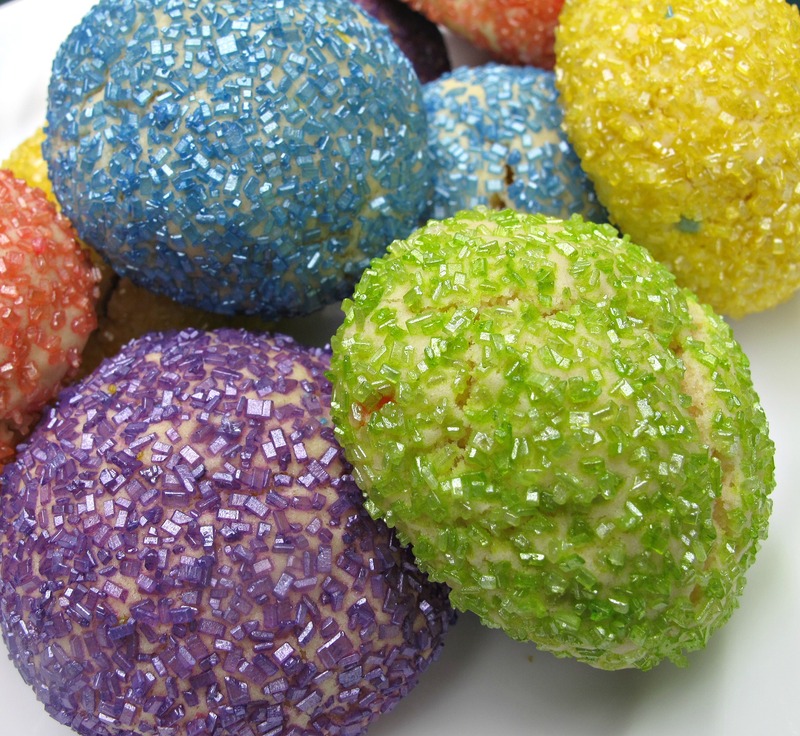 Sparkling Lemon Cookies can be used for these balloons as well. There was a noticeable lack of chocolate in this care package due to summer heat. 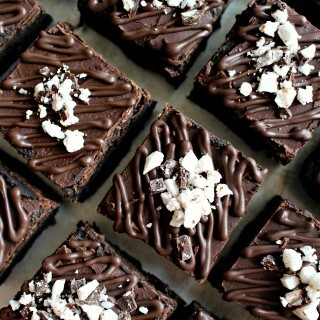 A batch of desert safe brownies helped to restore balance to the universe. 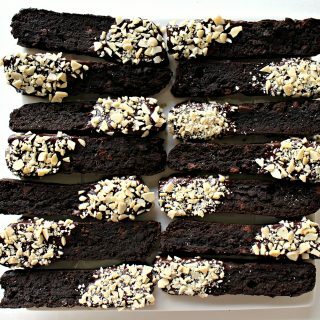 This recipe for long lasting, soft and chewy brownies was developed by the Nestle’s test kitchens especially for military care packages using desert safe guidelines. For long distance shipping, I always recommend that brownies/blondies/bar cookies be mailed uncut, the whole pan well wrapped first in foil then in plastic wrap before sealing in a large ziplock bag. Parts 2 and 3 Circle Sugar Cookies and New Recipe: Funfetti Birthday Sugar Cookies are both the circle sugar cookies and the new recipe in this care package. I love the sugar cookie recipe that I usually use. It holds its shape, it tastes delicious, and it stays delicious for weeks. Part of that deliciousness is the butter in the recipe, and baked goods made with butter don’t always travel well in hot summer weather. I was excited to find Funfetti Birthday Sugar Cookies on the Crisco site. Vegetable shortening is considered a desert safe ingredient because it is the fat that is least likely to go rancid in extreme desert temperatures. This vegetable shortening sugar cookie is good! Like the cookies made from the butter based recipe, these cookies hold their shape and last for weeks. My solution to the “no icing in the heat” dilemma was sprinkles. 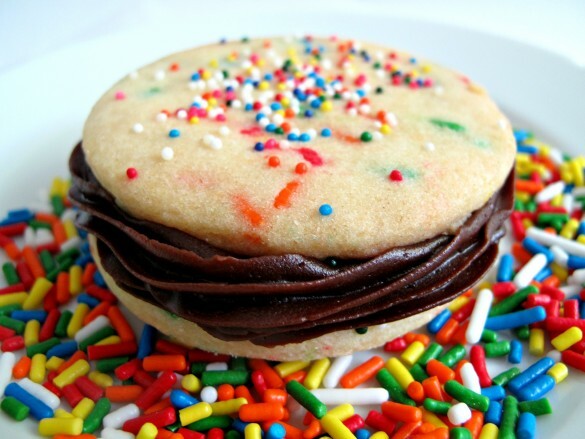 Sprinkles ease many of life’s dilemmas. 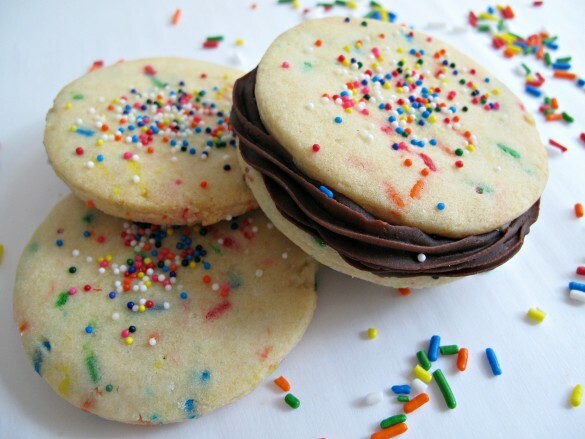 In this case, funfetti (jimmies) sprinkles in the batter and non-parelle sprinkles on top turn these circle cookies into a celebration. Happy 23 birthday, Paratrooper Derik! As you celebrate your birthday far from home while you serve your country, please know that you and your fellow paratroopers are in our thoughts. 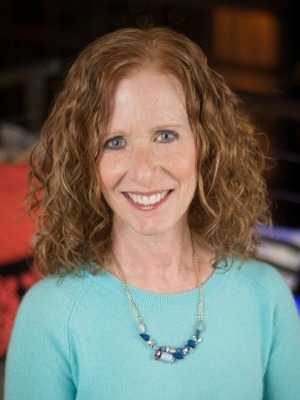 Thank you for the job you do! In the bowl of an electric mixer, cream together vegetable shortening and sugar. Gradually add the flour mixture to the shortening mixture. Roll out dough to 1/8” thickness on floured surface or between two sheets of parchment paper. Cut out 2 ½” circles with a cookie cutter or drinking glass rim. Re-roll excess dough to cut out more cookies. Optional: Sprinkle tops of cookies with sprinkles and press gently with fingertips to help the sprinkles adhere to the cookies. Bake for about 10 minutes, until the bottom edges begin to turn golden brown. Cool for 5 minutes on the cookie sheet before transferring to a wire rack to cool completely. 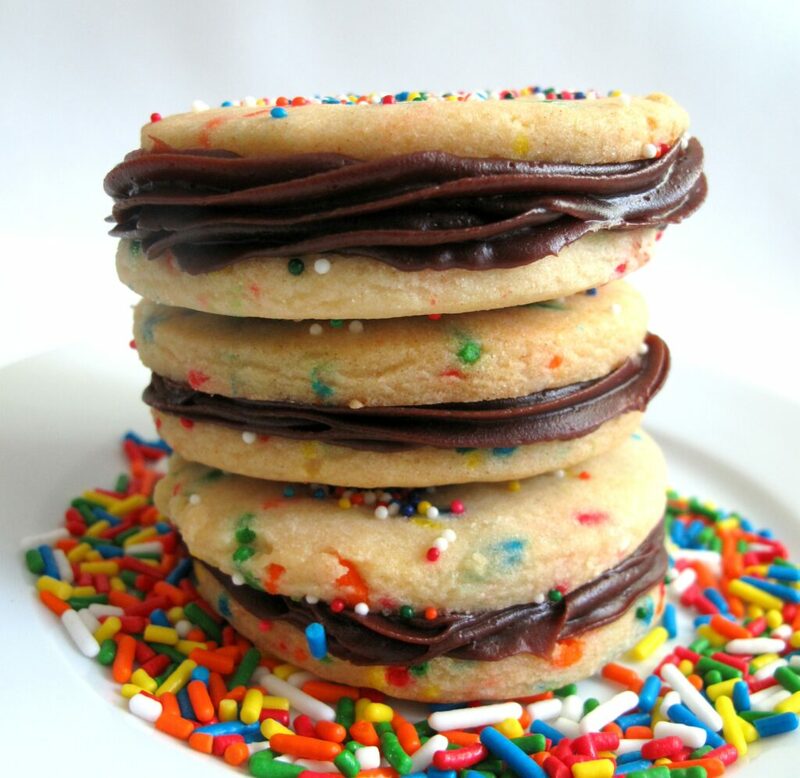 Optional for making frosting sandwich cookies: Spread or pipe icing onto one cookie bottom side up. 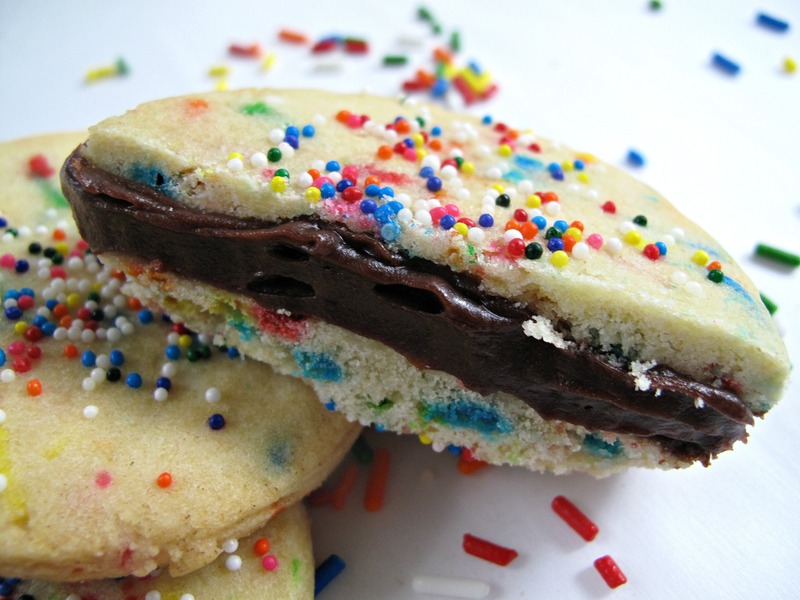 Cover the frosted cookie with a second cookie. Serve immediately or refrigerate for several days. The frosting will firm when cold and will lose its glossy appearance but will still taste good. These are so great! I love the theme. Every picture along the way was a piece of art . 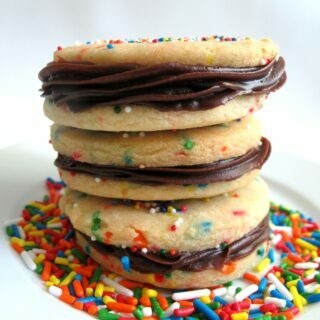 . . and then to top it all of you sandwiched them with fudgy chocolate. Yummers! You are so sweet! Thanks! Working on photography is my biggest challenge (next to figuring out social media!) so I really appreciate the comment! You are right about the cookies. 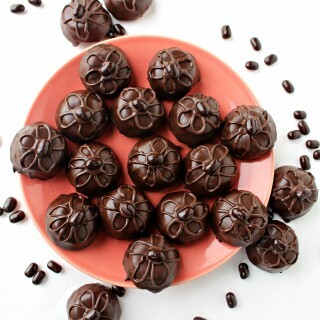 They were very tasty alone, but special once they were sandwiched with chocolate! This is awesome! 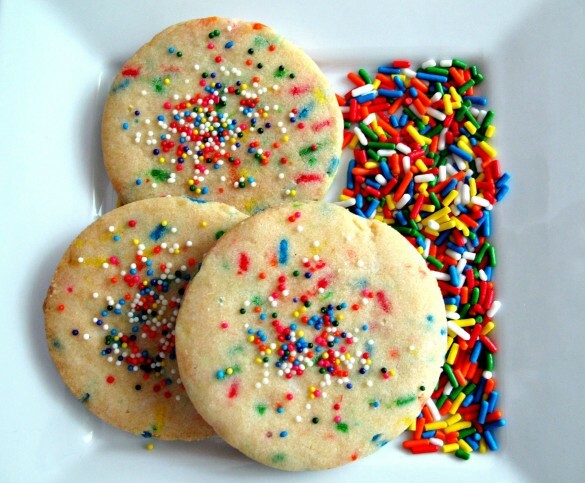 i used to love to make funfetti cookies….yum! Thanks, Kristen! Sprinkles seem to make whatever they touch into a party! I am so glad that I found your site via Learn To Blog. I love love love all the wonderful and useful and delicious information that you provide. How I wish that I had access to your knowledge, when my grandson’s father was deployed. Crossing our fingers that there will be no more deployments during the final years of his career, but if he does have to go again, I’ll know exactly what to send to him. With 10 grown kids and 23 grand kids spread across the country, I’ll be coming back again and again for ideas and recipes! Hi, Libby! I am so glad you found The Monday Box, too! I wish there was no reason for any soldier to be deployed, but as long as someone’s son/daughter is serving our country far from home I am hopeful that Monday Box recipes can help make their care packages delicioius! 🙂 I am thankful to the men and women of our armed forces and to their families for the sacrifices they make! I will cross my fingers along with you in hoping that your grandson’s father can finish out his career without further deployment! I am completely awed that with 10 kids and 23 grandkids you find the time to bake! What a lucky group your family is! Thank you for your kind words. 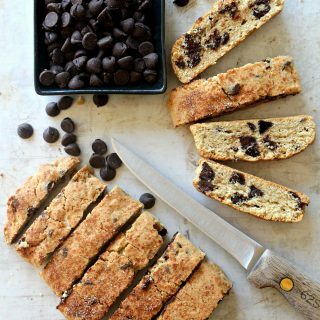 I hope you will try a Monday Box recipe and let me know what you think! these cookies look so delicious.. loving all the funfetti sprinkle action going on. craving a bite of one now! Thank you, Thalia! Birthdays call for lots of funfetti sprinkle action. 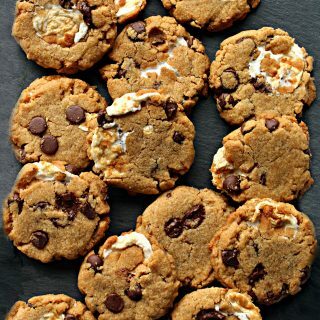 🙂 These cookies are crave worthy. 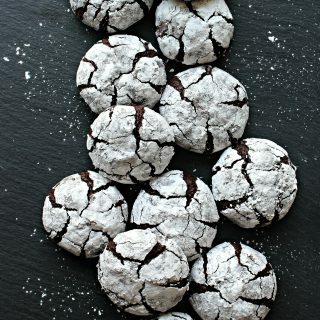 I pinned this before, but just love these cookies. Also the balloon ones are so pretty. Thank you so much for your kind words, Candi! I love that these cookies are delicious, pretty/fun, and ship well in warm weather. I will be using the recipe over and over. 🙂 Thanks also for the pin! What a very nice birthday package. That filling looks yum! Thank-you so much for sending this to him! I bet he loved it! 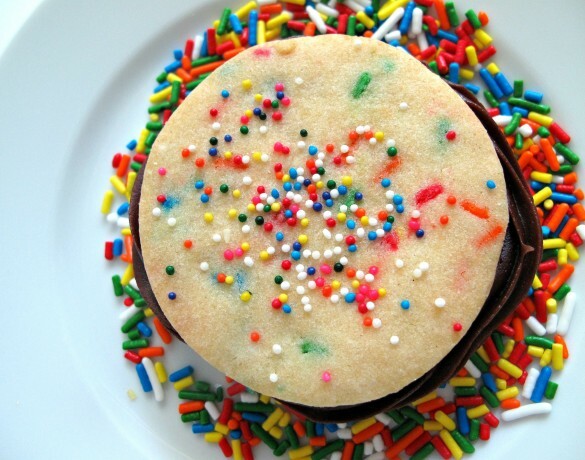 The sprinkle balloon cookies are so pretty! Very festive and birthday-ish. I hope you are doing well and healing! Thanks, Reeni! I am honored to have the opportunity to create these military care packages. I hope they deliver smiles as well as sugar! The balloon cookies are one of the best care package cookies I have found. They stay soft on the inside and sugar crunchy on the outside for a long time. I hope your ankle is much, much better these days, Wendy. I’m glad you are much more mobile. This made me smile because there’s just something about sprinkles that is so wonderful! 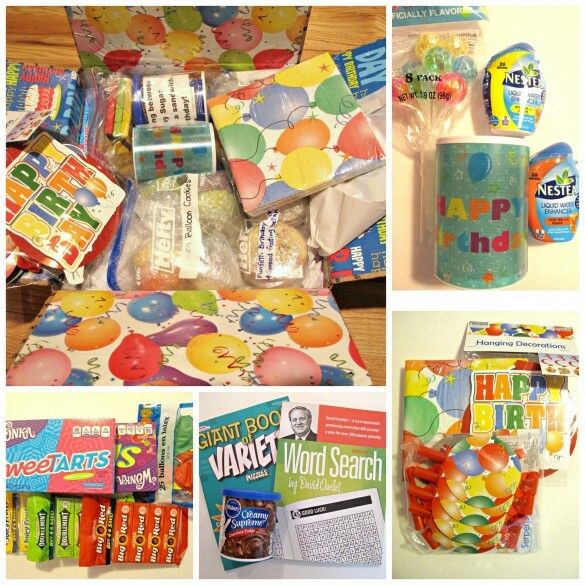 And who doesn’t love a birthday theme and a special care package for such a special occasion. I think you did a wonderful job and I’m sure the recipient appreciated it.